Over twenty credited movie roles on his IMdb page testify to David Bowie’s impressive body of film appearances. Not that he was an actor of extraordinary range. Although displaying a similar to aura to Jeremy Irons, it is difficult to imagine Dead Ringers or Die Hard With A Vengeance with the superstar in those roles. Bowie’s big screen company was more along the lines of Brad Pitt or Keanu Reeves. Actors whose performance ability is relatively narrow, but can be electrifying on the big screen when used effectively. His first credited big screen appearance was in The Man Who Fell To Earth. Ostensibly playing an alien, the kaleidoscopic film can be read as a pretty accurate reflection of experiences the coke and excess addled Bowie was then going through. Later roles would include Jareth The Goblin King in family favourite Labyrinth, a bizarre Texan-accented cameo in Twin Peaks: Fire Walk With Me, and inventor/magician Nikolai Tesla in Christopher Nolan’s The Prestige. 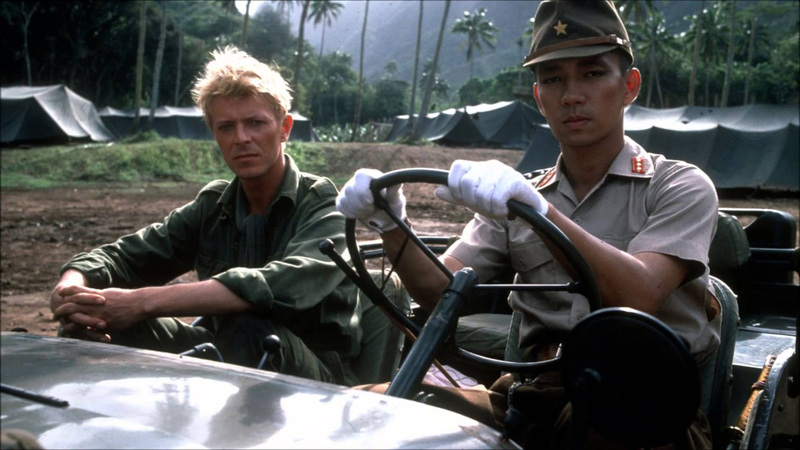 But, for us David Bowie’s best performance and best film was 1983’s Oshima Nagisa’s Merry Christmas, Mr. Lawrence. 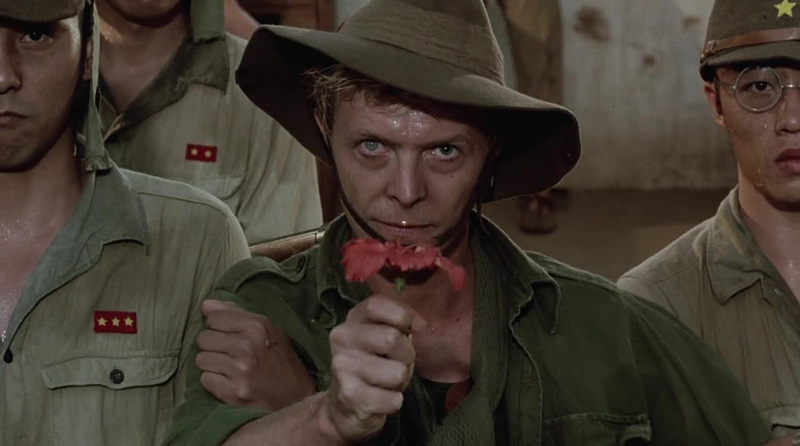 A Japanese prisoner-of-war movie with Bowie playing Christ-like figure Major Jack Celliers (a role originally intended for Robert Redford), the film is surreal, lyrical, haunting, violent and often hugely moving. Set in Java, 1942, the film centres on Colonel Lawrence (Tom Conti), a Japanese-speaking go-between in a POW camp attempting to keep peace between a bullish British colonel (Jack Thompson) and the camp’s commandant, Captain Yonoi (Japanese musician Sakamoto Ryuichi) and his bulldog, Sergeant Hara (Kitano Takeshi, in his first film role). This uneasy peace is broken when New Zealander Celliers enters the camp and becomes a subject of fascination, infatuation and anger for Captain Yonoi. Critics and historians talk about Scarface, also released in 1983, as the quintessential 80s movie. Yet, this movie is also a trademark product of that heady decade. Boasting not one, but two stadium rock stars, Bowie and Sakamoto, Merry Christmas, Mr Lawrence also foreshadows the uneasy relationship the West would have with Japan during the Eastern country’s miracle decade of runaway economic growth. A spirit of 80s abandon also permeates. Not at surface level, the film is as formally rigid and composed as Oshima’s previous movies, but in how different performance styles and cultural mannerisms knock the film off-balance. Bowie and co-star Tom Conti have said Oshima focussed on the Japanese actors and told the Westerners to “do whatever it is you do”, meaning the film is a mix of Conti’s classically trained character acting, Bowie’s instinctive performance and a stylized Japanese method practiced by Sakamoto. The singer declined Oshima’s offer to provide a score for the film, focussing instead on his acting. Sakamoto’s BAFTA winning synth score, while anachronistic to the period, perfectly fits the film’s dreamlike mood and gave the film an evergreen hit single. Largely confining action to the prison camp on Java (actually a Polynesian island), the film feels set on another planet, governed by rules and customs alien to the British, Australian and New Zealand forces held captive. And at the centre of the film is David Bowie’s Jack Celliers. A “soldier’s soldier” as Lawrence describes him to Yonoi, though played the physically slight Bowie Celliers exudes a leader’s spirit and magnetism amongst the men in the camp, including Yonoi. 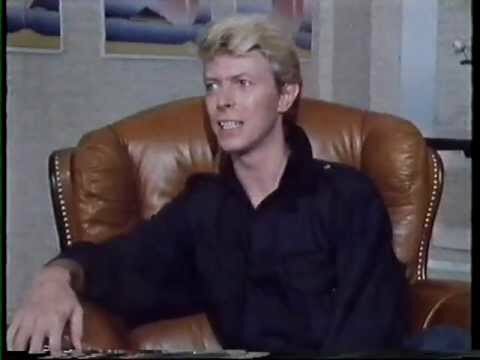 Oshima described Bowie as a “pure angel”, while co-writer Paul Mayersberg (who coincidentally scripted The Man Who Fell To Earth) declared him an “extremely talented amateur”. Mayersberg altered the script to focus on Bowie’s flair for physical performance, paring away dialogue to absolute essentials. 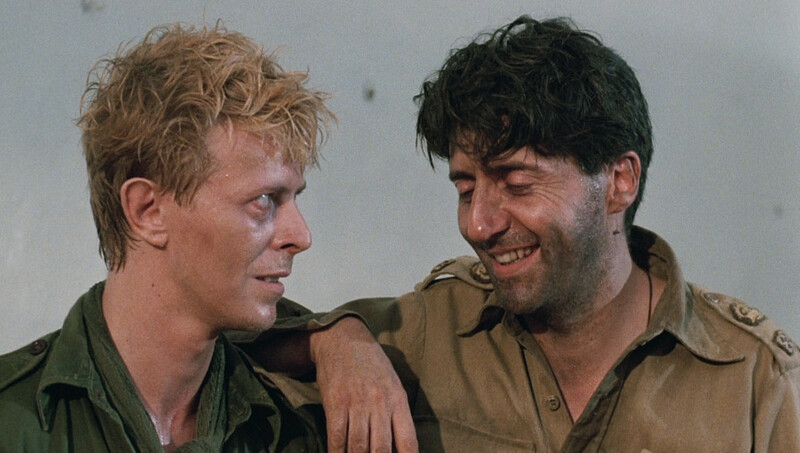 Bowie’s performance is best captured in an affecting scene when mimicking a final shave, meal and breakfast before Celliers goes to what he believes will be the firing squad. Calling on mime techniques he learnt under Lindsay Kemp, he also indulges himself an accent as the barber. Yet, Mayerberg may have been selling the Brixton born Bowie short on his dramatic abilities. Conti did the bulk of heavy lifting in the film, but Bowie’s unpolished style brought a naturalism to his role, be it goading Yonoi by smuggling in contraband food or confessing past sins to Lawrence. He demonstrated a talent for dramatic dialogue and underplayed big character moments for greater, unexpected effect. Aptly for a character with the initials JC, self-sacrifice is a key story point. We won’t spoil it here, but this moment of sacrifice is one of cinema’s most arresting and moving scenes, a climactic clash of cultures given to two non-actors, Bowie and Sakamoto. Despite a Palme d’Or nomination at Cannes, the film did not receive a large amount of award consideration (the BAFTA it won for score was its sole nomination at those awards). And reviews were mixed, Time Out’s Geoff Andrews panning the film with, “Oshima’s handling of the narrative is not so much elliptical as awkward, and Bowie’s performance is embarrassingly wooden.” We shudder at what he would have made of Bowie’s The Hunger, also released in 1983. Yet, like all great movies, Merry Christmas, Mr. Lawrence’s reputation has grew over the years, the artistry and unusual telling of a staple war film genre appreciated by successive audiences and the august Criterion Collection releasing a special blu-ray edition in 2010. Plus, with a 7.3 IMdb score and 79% “freshness” on Rotten Tomatoes, the film, and Bowie’s unusual, fascinating and moving performance, is likely to be around for a while yet. Note: Japanese names are written in the traditional fashion, family name first.